Time seems to have always been a fascination for Christopher Nolan, and he’s used it in all sorts of mind-boggling ways throughout his career, such as showing how hours, days and even years go by in mere seconds in more recent films like Inception and Interstellar, non-linear narratives that regularly cut to flashbacks every so often in his Dark Knight movies, and even the movie that put him on the map, Memento, is now infamous for its backwards storytelling. It is a subject that he clearly admires and wants to represent it in as many daring and provocative ways on the big screen as possible, which is part of what makes him one of the most fascinating filmmakers working today. But now, he has outdone himself with his most ambitious and riskiest representation of time yet – only this time, he’s doing it while also telling a real-life story of heroism and despair during an early episode of the Second World War. 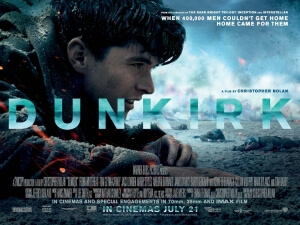 Dunkirk tells the story of how, when British and French troops were stranded on the beaches in the titular town in Northern France, surrounded at every turn by enemy forces and waiting desperately for a ship back to England, numerous civilian boats came to the rescue of over 300,000 men and brought them home. But what is fascinating about Nolan’s vision of this tale is in his chosen structure which, again, plays around quite a bit with the prospect of time. The film is split into three segments, all of which take place over a certain amount of time – the first, which focuses on a small group of young soldiers (Fionn Whitehead, Aneurin Barnard and Harry Styles) stranded on the beaches, takes place over a week; the second, about a British sailor (Mark Rylance) who takes his small boat across the Channel to pick up some of the soldiers, is told over a single day; and the third, which a couple of Spitfire pilots (Tom Hardy and Jack Lowden) taking to the skies and bringing down any enemy planes they can find, is set over the course of an hour. All of these segments go together extraordinarily well, through the power of fantastic editing that really keeps the momentum going all throughout, and Hans Zimmer’s tension-building score that just keeps rising and rising from the very first few frames of the film and right up to the very last scene. Some may be put off slightly by the non-linear approach to these segments, which can lead to some rather sporadic transitions – a scene that takes place at night in one timeline can suddenly change to one that takes place during the day – but they are all so seamlessly strung together that it flows very naturally and feels like one giant continuous sequence, even though they are all taking place at different lengths of time. Nolan commands these scenes with fierce precision, making you feel every single bullet, every last screaming bomb being dropped, and every other crashing wave on the beaches of Dunkirk. Throughout his career, Nolan has been likened to Stanley Kubrick for his grandiose approach to filmmaking and the sheer scope of craftsmanship on display, and this is easily the kind of movie that Kubrick would have made back in the day, one that takes such a simple situation and turns into a serious spectacle that deserves to be seen on the big screen. Every single frame, about 75% of which was entirely shot on IMAX (which, if you can, is the only way to fully experience this film), is what cinema is made for, from the haunting shots of ghostly beaches to the rip-roaring POV angles of swerving Spitfire cockpits to the disorienting and terrifying scenes of giant water walls closing in on drowning soldiers in the middle of the sea. Cinematographer Hoyte van Hoytema will most likely be recognised this coming awards season for his stunning work here, as will hopefully Nolan for taking the wheel on this heavy bit of machinery and steering it steadily towards its ultimate goal with hardly a scratch. Those, however, seeking a movie where one can form emotional attachments with the people involved will probably walk away from this film feeling a little cold. While there are some great performances from its ensemble cast – including, in perhaps the most shocking thing to emerge from this movie, a solid acting turn from One Direction’s Harry Styles – characterisation is merely an afterthought, and because there is not that much dialogue in the film (the section on the beach is practically a silent film) there isn’t a lot to latch onto with any of these characters. But that’s because they aren’t what Nolan has his eyes on; his goal is to present an experience, in particular that of being in this rotten situation with enemy bombs and bullets flying at you in every direction, or in the air flying around in the cloudy skies that blanket the English Channel, or sailing out into unsafe waters where almost anything could happen at any given moment. The beauty of these three segments going together as well as they do is that they collectively present an overwhelming feeling of dread and despair, but at the same time a sense of hope that eventually, all these terrible things will pass and, in time – whether it takes a week, a day, or even an hour – there will be light at the end of the (Channel) tunnel. It is Christopher Nolan’s finest accomplishment yet, and his greatest experiment with his favourite subject of all: time. Dunkirk is director Christopher Nolan’s finest film to date, delivering a raw and visceral experience of war unlike any you’ve yet seen on the big screen, with a unique non-linear approach that works spectacularly well against all odds, and some amazing displays of craftsmanship from its editing to the cinematography that are sure to be recognised, along with Nolan himself, come this forthcoming awards season. See it on the biggest screen you can, preferably an IMAX – you’ll thank me for it later.